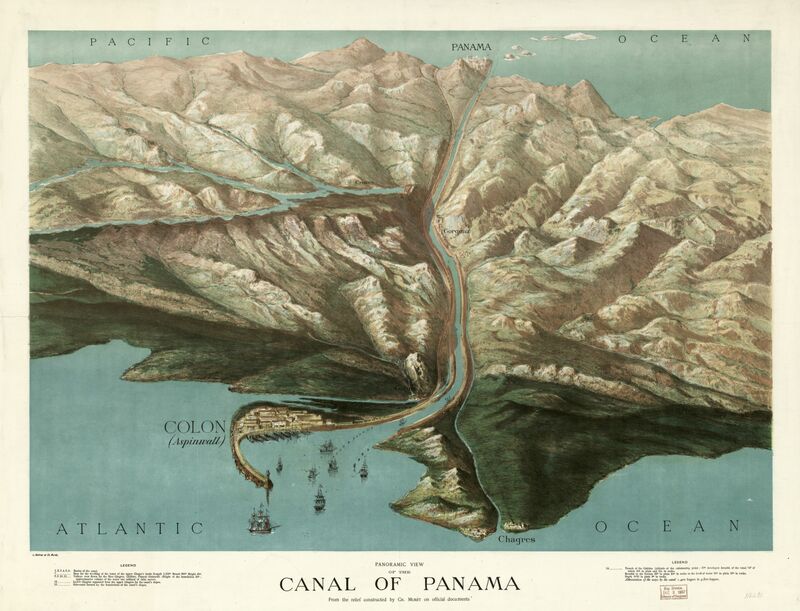 The Panama Canal Expansion is the largest project at the Canal since its original construction. The project will create a new lane of traffic along the Canal through the construction of a new set of locks, doubling the waterway’s capacity. The original French project was entirely at sea-level, without locks. Locks were only decided in 1906, a few years after the US took over the thing, and since the map is stamped from 1907, it's possible that it's based on the older design. New Locks (Third Set of Locks), which is the construction of two lock complexes, which will create a third lane of traffic. Pacific Access Channel, also known as PAC4, which is the excavation of a 6.1 km-long access channel for the new Pacific locks to bypass Miraflores Lake. Dredging of the navigational channels along the waterway. Improvements to water supply by raising Gatun Lake maximum operational level by 45 cm to improve the Canal’s water supply and draft. 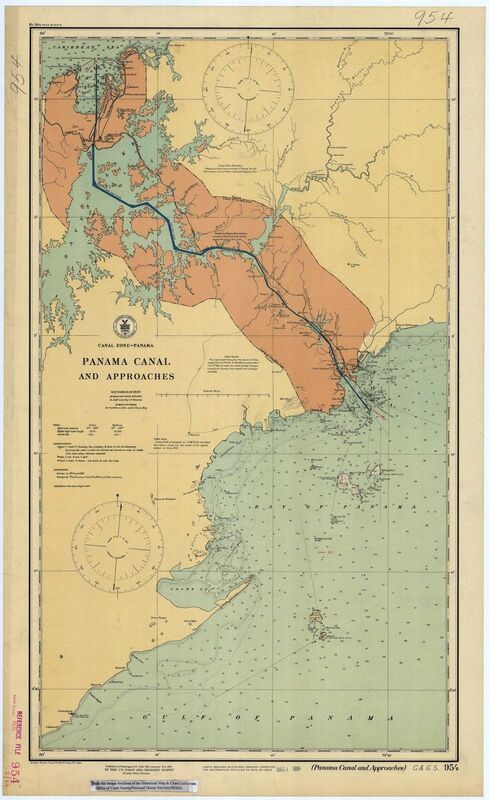 The largest infrastructure project since the waterway’s original construction, the Panama Canal Expansion Program will create a new lane of traffic along the Canal through the construction of a new set of locks, doubling the waterway’s capacity. 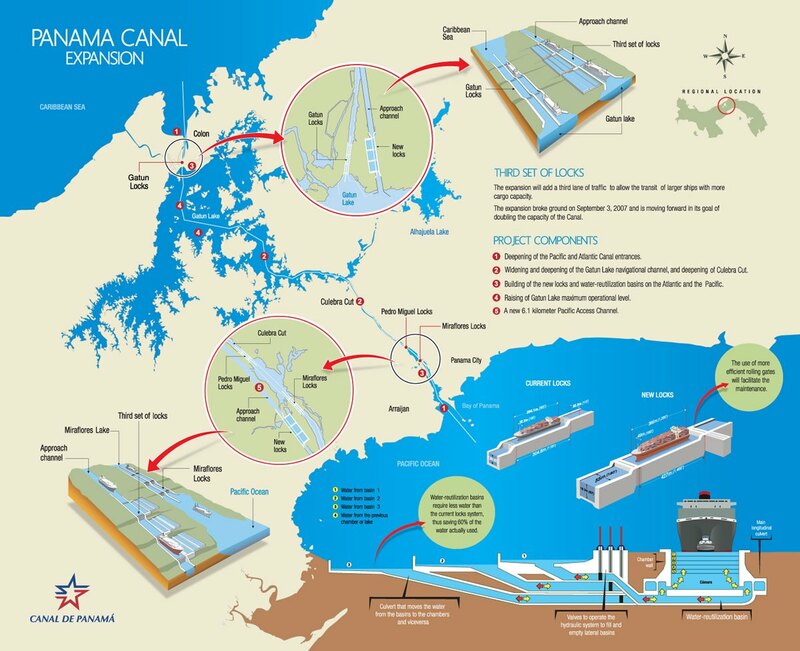 The largest infrastructure project since the waterway’s original construction, the Panama Canal Expansion Program will create a new lane of traffic along the Canal through the construction of a new set of locks, increasing the waterway’s capacity. The new locks will have three chambers, water-saving basins, lateral filling and emptying system & rolling gates. Wreckage of Captain Cook's HMS Endeavour discovered ? "HMS Endeavour off the coast of New Holland," by Samuel Atkins. Researchers believe they have found the wreckage of the HMS Endeavour, vessel of legendary British explorer, James Cook. Cook commanded the ship from 1768 to 1771 on his famous voyage mapping the uncharted waters of the south Pacific Ocean, but for years its whereabouts have remained a mystery. After exploring far-flung lands the boat passed through a number of different hands before it was renamed the Lord Sandwich and used in America's revolutionary war. "Lord Sandwich was the first lord of the admiralty at the time so the name makes sense -- a nod by its private owner," Dr Kathy Abbass, the executive director of Rhode Island Marine Archaeology Project, a not-for-profit organization set up in 1992 set up to study the area's maritime history, told CNN. "We know from its size, dimension and these records that the Sandwich was the Endeavour." Now the Rhode Island Marine Archeology Project (RIMP) says it has managed to identify the wreckage of the Lord Sandwich in Newport harbor, off the state of Rhode Island. The organization says the ship was scuttled there by British forces in the lead up to the 1778 Battle of Rhode Island. "The American army was assembled on the mainland and the French sent a fleet to help," says Abbass. "The British knew they were at great risk so they ordered 13 ships out to be scuttled in a line to blockade the city. They were sunk in fairly shallow waters." They now believe this particular piece of history lies on the seabed alongside the 12 other vessels that made up the fleet. According to RIMP, the wreckages are spread across nine different sites, and "one group of 5 ships includes the Lord Sandwich transport, formerly Captain James Cook's Endeavour." The group now plans a more detailed exploration of the site and "a more intense study of each vessel's structure and its related artifacts." One of the most famous ships in naval history, the HMS Endeavour was the boat on which Captain James Cook achieved the first recorded European contact with the east coast of Australia, Hawaii, and the first circumnavigation of New Zealand. 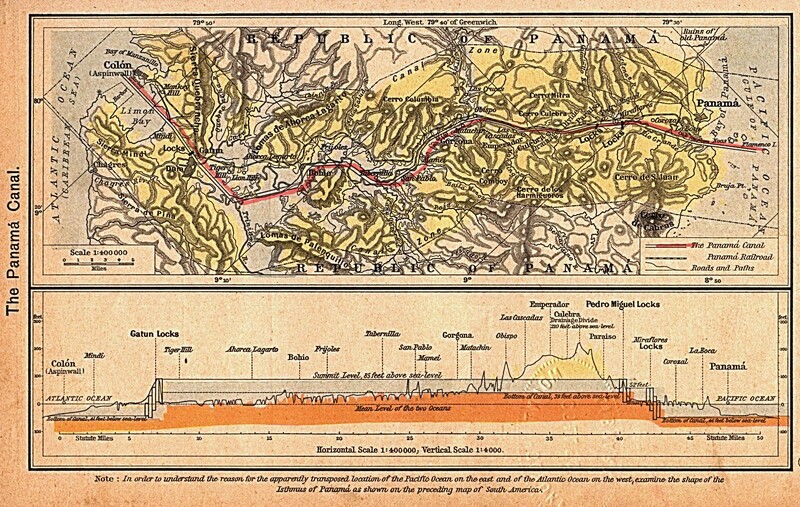 Cook also provided the first accurate map of the Pacific and is believed to have shaped the world map more than any other explorer in history. BBC : Endeavour: Has the ship Captain Cook sailed to Australia been found? The Guardian : Captain Cook's Endeavour: from the Great Barrier Reef to Rhode Island? This stunningly beautiful jellyfish was seen during Dive 4 of the 2016 Deepwater Exploration of the Marianas expedition on April 24, 2016, while exploring Enigma Seamount at a depth of ~3,700 meters. Scientists identified this hydromedusa as belonging to the genus Crossota. Note the two sets of tentacles — short and long. At the beginning of the video, you'll see that the long tentacles are even and extended outward and the bell is motionless. This suggests an ambush predation mode. Within the bell, the radial canals in red are connecting points for what looks like the gonads in bright yellow. On April 30, 2016 at 11:20 AM William Trubridge set an incredible 16th World Record. This record setting dive in free immersion (FIM) saw him descend 122m into Deans Blue Hole and back in four minutes and : 24 seconds time -- at #VB2016, an elite freediving competition he hosts annually. Scientists have begun to believe that we humans spent many millions of years of our evolutionary development living a semi-aquatic existence. Not as a strange, gilled half-man, half-fish creature, but as an aquatic ape. Standing on two legs in the shallows in order to breathe and evade land-bound predators, our hairy forebears used their hands to gather a bounty of easily harvested food, high in protein and omega oils that helped to facilitate brain development. As a theory, the idea of the aquatic ape helps to explain the layer of subcutaneous fat we have under our skin to keep us warm; the way our finger-tips wrinkle after extended time in the water, making it easier to grip things underwater; and, of course, the famous ‘mammalian dive reflex’, which enables us to freedive deeper, safer and longer. Studies have also shown that if trained early enough, our eyes can adapt to seeing underwater, and we know that if babies are immersed in water their eyes open, their epiglottis closes and they can ‘swim’ back up to the surface. In terms of our more recent history, we know for a fact that humans have been freediving for food for at least 8,000 years. Archaeologists investigating the mummified remains of the Chinchorian, an ancient peoples that lived circa 6,000BC in what is today Chile, found them to have suffered from exostosis, the condition where the bones of the ear canal start to grow across the opening to help protect the eardrum from repeated exposure to cold water. It’s a condition known in modern parlance as ‘surfers ear’, though divers, surfers and kayakers are equally likely to suffer from it – as is anyone who’s repeatedly dunked underwater. The Chinchorian and their ilk weren’t freediving for pleasure, though, but for food and goods to trade. Pearls and sponges were among the first underwater items to find value amongst in-land societies and those without the skills with which to dive for them. In 332 BC, Alexander the Great famously used freedivers to dismantle the underwater booms preventing his ships from entering the harbour during the siege of Tyre. In 1913, uniting warfare and commerce, a Greek sponge diver, Stotti Georghios dived to over 60m to locate the missing anchor of the pride of the Italian navy, the Regina Margherita. 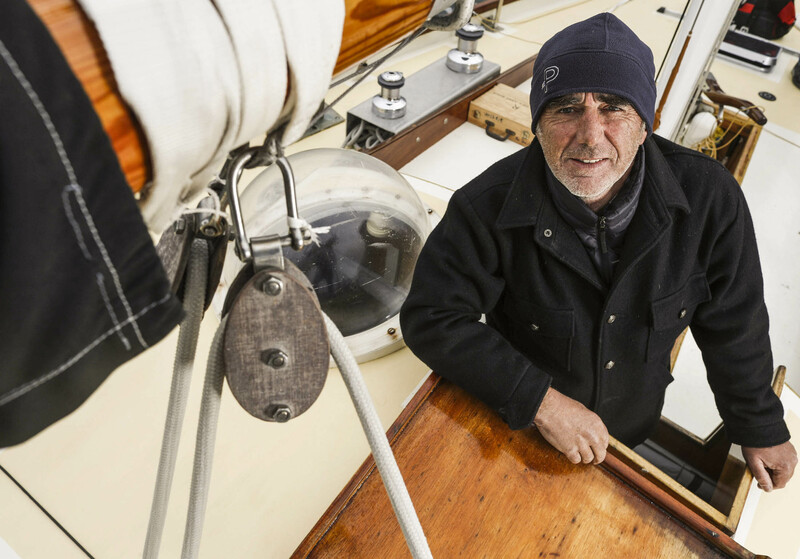 Stotti was no Greek god, mind; weakened by pulmonary emphysema and half deaf from perforated eardrums, he dived for over three minutes, getting to depth by holding onto a giant rock and tying a rope around his waist so he could be pulled back to the surface. Despite the tale of Stotti Georghios making the headlines, freediving wasn’t a means of recreation in those days, mainly due to the problems of the cold, restricted vision and trouble equalizing. In 1927 Jacques O’Marchal invented the first mask designed to enclose the nose and in 1938 Maxime Forjot improved it, using a compressible rubber pouch to cover the nose that enabled divers to pinch shut their nostrils, making it easier to equalize the pressure in their ears. Another Frenchman, Louis de Corlieu, patented fins in 1933 as ‘swimming propellers’. His design was later modified and mass produced by an American, Owen Churchill. Seeing the potential for their use in wartime, the Britain and the US purchased big quantities during WWII. In 1951 a physics student and diver called Hugh Bradner developed the first wetsuits from neoprene, and again the US Navy snapped them up— this time for use by marines in the Korean war. 1949 was the birth of modern freediving as we know it, when Raimondo Bucher, a Hungarian-born Italian air force captain, dove 30m to the bottom of the sea near Naples on a wager. Scientists confidently predicted he’d die from the crushing pressure at that depth, but he returned to the surface unscathed and 50,000 lire better off. Over the following two decades freediving exploded in popularity, offering a heady mix of competition, science and derring-do, with the trinity of Bob Croft, Jacques Mayol and Enzo Majorca at center stage. Bob Croft, a US Navy diving instructor, spent 25 hours a week in a 30m deep tank teaching submariners how to escape from stricken submarines. There he began breath hold training and could soon hold his breath for over six minutes. These amazing abilities got him a job as a guinea pig for Navy scientists looking to discover if the phenomena known as ‘blood shift’, which had been witnessed in diving mammals, could happen in humans. Croft also developed the technique of lung packing, forcing extra air into his lungs prior to a dive or breath hold. Encouraged by his colleagues, Croft established three depth records over a period of 18 months and in 1967 became the first person to dive beyond 64 meters (the depth scientists believed was the physiological depth limit for freediving). He would go on to reach a depth of 73m in 1968 before retiring from competitive freediving. Enzo Majorca, an Italian, achieved his first world record in 1960 with a dive to 45m and in 1962 became the first person to break the 50m mark. He continued breaking records until 1974 when, during an attempt to reach 90 meters, he collided with a scuba instructor. Upon re-surfacing, Majorca gave vent to his frustrations with a torrent of foul language – all picked up by the live TV cameras that were present to record his moment of glory. He was subsequently banned for 10 years. His official return to the sport in 1988 was marked by a dive to 101m – his last before retiring. Both his daughters, Patrizia and Rossana, continued to do the Majorca name proud, notching up several world freediving records between them. The Big Blue, the film by Luc Besson, fictionalized the competitive relationship between Enzo Majorca and Jacques Mayol. 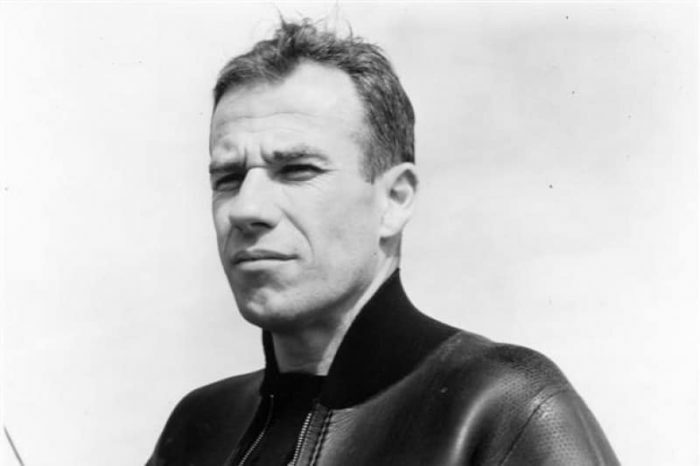 Jacques, a Frenchman, was the first person to break the 100m barrier and he also served as a test subject for science, demonstrating that his heartbeat decreased from 60 beats per minute to 27 during that dive. Science had always been playing catch-up when it comes to explaining the incredible feats of freedivers, and the governing body at the time, CMAS, became more and more alarmed at the depths that Mayol and Majorca were descending to, so much so that it decided to stop ratifying records in the early seventies in an attempt to dissuade further attempts. This didn’t stop the record attempts, though, and in 1988 Italian Angela Bandini stunned the world with a 107m dive. The world of competitive freediving lifted many more divers to prominence in the nineties and continues to do so in the present day. We don’t have the room to name them and their incredible achievements here, save for five Tanya Streeter, Umberto Pelizarri, Natalia Molchanova, William Trubridge and Herbert Nitsch. Tanya Streeter began breaking records almost immediately when she began freediving in her mid-twenties and in 1998 reached 113m with a No Limits dive. A fearless competitor, she twice held records that were deeper than the men’s equivalent: a No Limits dive to 160m in 2003 that has never been broken, and a record Variable Weight dive to 122m that was held for seven years. 24 ottobre 1999: Impresa di Umberto Pelizzari che nelle acque del Tigullio ha sfondato il muro dei -150 metri in assetto variabile nel tempo di 2'57". Also setting the freediving world alight in the 90s was the Italian Umberto Pelizzari, achieving records in Constant Weight, Variable Weight and No Limits freediving. He founded the freediving agency Apnea Academy, wrote a manual of freediving, and today teaches and works as a TV host and university professor. The late Natalia Molchanova has, to date, 40 world records and was still breaking records in her fifties. She has held every single woman’s’ world record, except for a single No-Limits variant that she never attempted. Molchanova was the first woman to pass the 100m mark in the discipline of Constant Weight, reaching 101m in 2009. In that year she set five new world records and took all five gold medals at the two AIDA individual world championships. William Trubridge, a double world record holder, has the distinction of being the first person to dive to 100m in the discipline of Constant Weight without fins. Herbert Nitsch is an Austrian freediver who has held 32 world records across every freediving discipline. He is the current No Limits world record holder after descending to 214m – a depth that is unlikely to be beaten for many years due to the extreme difficulty and risks involved. As you can see, the standard of competitive freediving rises each year, along with the number of recreational freedivers attracted to such a wonderful sport. Nowadays there are many agencies providing high-quality freediving courses and tuition – something that could never have been imagined even ten years ago. The robot, called OceanOne, is powered by artificial intelligence and haptic feedback systems, allowing human pilots an unprecedented ability to explore the depths of the oceans in high fidelity. We, of course, cornered Oussama immediately afterwards, because humanoid robotic submarine what?! It turned out that OceanOne, as it was called, was involved in a top secret (or something) project in collaboration with the French, which has (now that it’s over and wasn’t a disaster) been un-topsecretified so we can finally, finally tell you about it. Originally, OceanOne was not an archaeological robot—it was conceptualized by King Abdullah University of Science and Technology (KAUST) in Saudi Arabia as a way of monitoring deep coral reefs in the Red Sea. OceanOne is different from, and arguably better than, traditional underwater ROVs for a bunch of reasons. It’s smaller, approximately the size of a human diver (about 5 feet in length), which helps keep it nimble. Rather than waterproofing the electronics to keep air in, they’re immersed in oil instead, which doesn’t compress, giving the robot a maximum depth of 2000 meters (!). OceanOne is designed to maneuver with precision in tight spaces using eight thrusters, and can autonomously keep itself stable in currents or surge. The robot’s most prominent feature is its pair of compliant, series-elastic arms, which apparently represent the very last project that Meka Robotics delivered before it was absorbed by Google. The wrists have force sensors in them, and eventually, the plan is to cover each finger with tactile sensors as well. With arms, hands, and a head stuffed with sensors, OceanOne is proportioned a lot like a human, which is one of the reasons it’s so revolutionary over existing ROVs. Christian Voolstra from KAUST with a more traditional ROV used for studying coral. With a traditional ROV, you’ve got this enormous boxy submarine thing with maybe a couple grabby arms on it. It’s functional for things like oil rigs, but around delicate coral or underwater archaeological sites, it’s not something that you can trust to not destructively smash into whatever you’re trying into examine. And the manipulators aren’t intuitive to use, and don’t provide the level of control or feedback that enable careful manipulation of fragile objects. OceanOne takes a new approach to underwater robotics: telepresence. It’s designed kind of like a human, because that makes it super easy for humans to use. 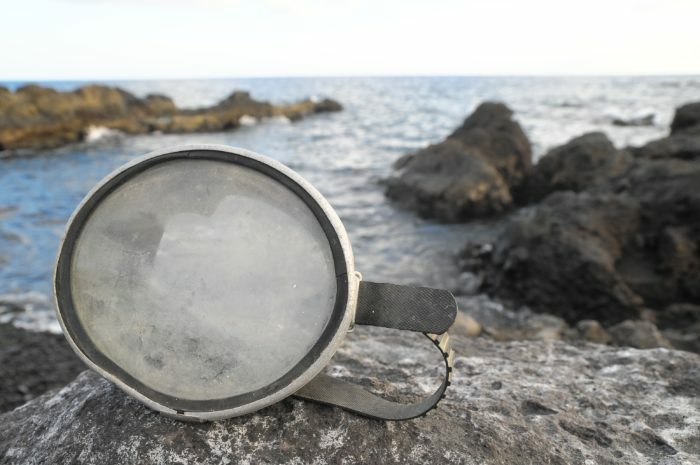 The perspective that OceanOne’s sensors give a user is similar to the perspective that your face has in relation to your own arms. Using haptic feedback, gripping objects without crushing them becomes simple and intuitive, even for people without a lot of experience. This, in general, is one of the arguments for making robots more like humans, even if it’s a design compromise that adds complexity while de-optimimizing the robot for whatever task it’s intended for. If you’re trying to (say) lift a piece of pottery out of a shipwreck, having two arms and a sense of touch is ideal, as long as a human is in the loop. It may not the be best approach for a fully autonomous system, but for OceanOne (at least for the foreseeable future), it’s working out very well. 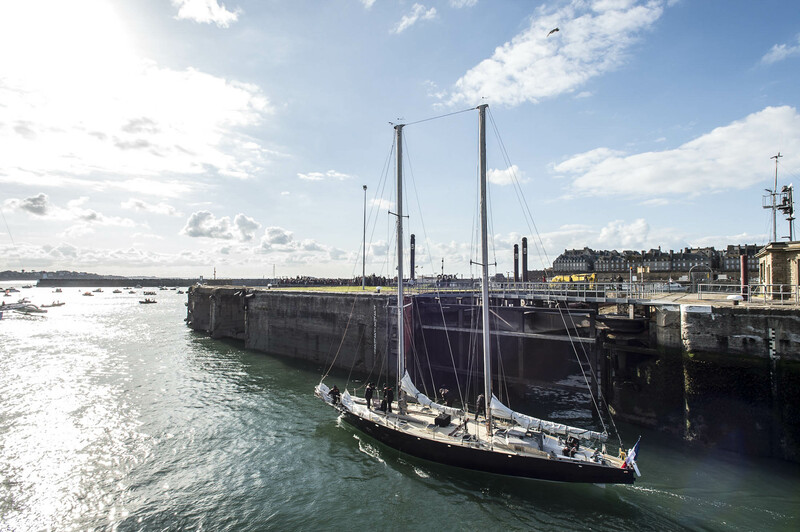 OceanOne’s first mission was to La Lune, the ex-flagship of King Louis XIV which sank 20 miles off the southern coast of France in 1664 in about 100 meters of water. One hundred meters may not sound like a lot, but the SCUBA expert we consulted told us that you’re unlikely to find a human down there without an enormous amount of training and lots of special equipment to keep them from dying. With guidance from a team of skilled deep-sea archaeologists who had studied the site, [Oussama] Khatib spotted a grapefruit-size vase. He hovered precisely over the vase, reached out, felt its contours and weight, and stuck a finger inside to get a good grip. He swam over to a recovery basket, gently laid down the vase and shut the lid. Then he stood up and high-fived the dozen archaeologists and engineers who had been crowded around him. Once the robot has proved itself, Voolstra hopes to use it to study mesophotic coral reefs, which live too deep for humans to explore with SCUBA gear but get passed over in “deep ocean” research. What we plan in particular is in situ physiological studies of coral reefs at depth. For instance, in situ fluorometric measurements of different coral species over depth gradients will provide information on low-light adaptation and production potential of mesophotic coral specimens. The current practice to study living things in the deep is to collect them and bring them up to the surface, but this means that you take things out of their natural context. Up until now, we were not able to study things undisturbed in their natural habitat. We’re incredibly excited to see what happens with OceanOne. It represents a totally new approach towards underwater manipulation, and it’s very cool-looking, which doesn’t hurt either. The press release suggests that we may be seeing a whole fleet (school? wolfpack?) of these robots all working together, either doing some serious research or pulling an underwater chariot just like in The Little Mermaid. The Transat is the Mother of all single-handed ocean races; the original contest that pitted one sailor and one boat against the sea. 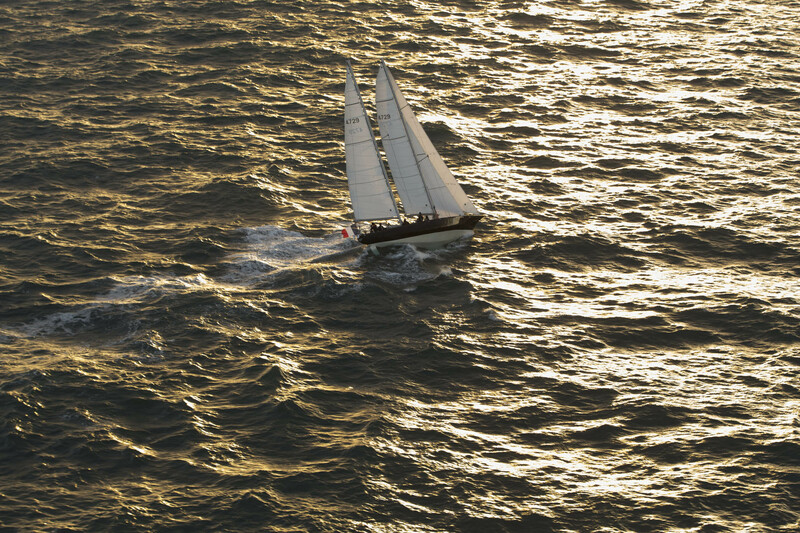 This race launched professional offshore sailing as we now know it. Upwind, into the ice & fog. 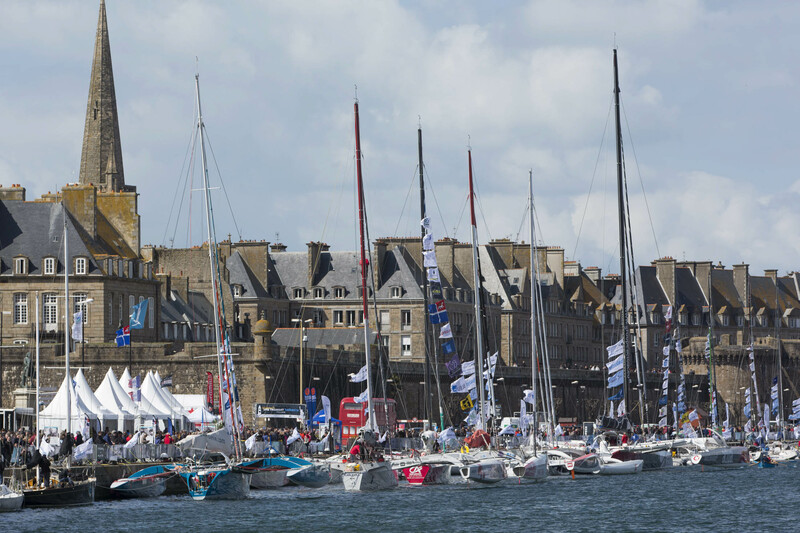 The Transat is still considered as one of the hardest of all ocean races. Tabarly, Colas, Fauconnier, Terlain in the Transat 40 years ago.